What makes professional grade multimedia podiums ideal for teachers, lecturers and other public speakers? 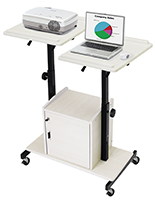 This type of presentation furniture combines all the features of a lectern with tabletop workstations as well as cabinet space for organizing accessories and equipment. Professional speakers, educators, and business users alike frequently use the latest devices and peripherals to create attention-grabbing, high-tech presentations. 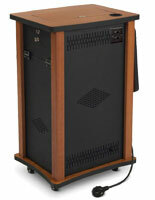 Today's stylish floor standing multimedia podiums with storage are able to easily integrate technology such as computers, laptops, projectors, webcams, and other electronic devices. Built-in storage cabinets, adjustable shelving, and variable-height work surfaces easily accommodate different equipment as needed. 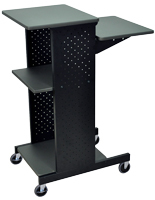 Easy to move multimedia podiums with wheels, commonly referred to as portable presentation lecterns, are available in different configurations, sizes, and designs to accommodate everyday workstation needs as well as facility use in public environments. 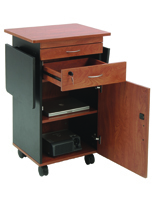 Office furniture include trays, shelves and compartments specially designed for computers, laptops or tablets. The durable stands will certainly be able to hold the various weights of the integrated technology. 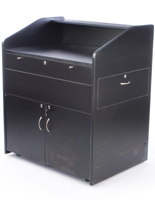 Presentation lectern models feature different materials and exterior to best coordinate with the specific setting. Floor standing multimedia podiums constructed from powder coated metal or laminated MDF wood combine a modern aesthetic with functional materials. 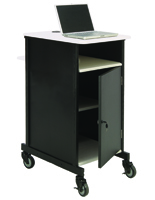 The office stand is available with wheels for conveniently transporting equipment between rooms or offices. 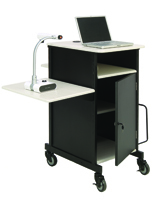 This type of workstation desk is a very popular option for schools and universities that have numerous classrooms. Each mobile presentation lectern comes with locks to stabilize the office furniture when the optimal presenting position is found. The versatile floor stands can be used effectively in any location that holds debates, lectures or other important demonstrations. 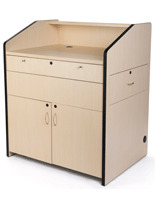 What type of equipment storage do presentation lecterns offer? Multimedia podiums offer a few different areas for setting up a computer, laptop, projector or other electronic device. 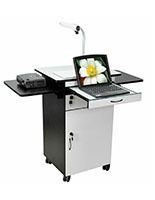 Each desk comes with a solid tabletop for accommodating integrated technology as well as lecturing notes. Customers should measure the audio visual device to ensure the electronics will fit on the tabletop. 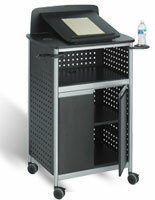 Floor standing office furniture often includes pull out shelving or folding leaves for placing a projector. The versatile computer stand allows users to open the shelves when needed. Lecturers are free to push in or fold down the shelving when the added space is not necessary. 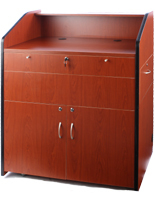 Cabinets are a convenient storage space, but can also be used to harbor non visual integrated technology. For instance, many lecturers choose to keep the computer modem inside the cabinetry. Amplifiers, iPods and other audio equipment conveniently fit into the cabinet space. When the lecture is finished, teachers can store all the integrated technology, audio and visual, on the shelving in the locking cabinetry. A workstation desk is a popular choice for countless businesses. 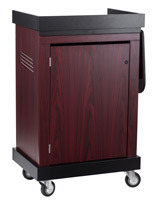 Many educational facilities keep floor standing lecterns on hand for special presentations that necessitate integrated technology. Hotels and other buildings that hold award ceremonies often have the lectern desk on stage for winners to use for speeches. Office furniture works well in boardrooms and conference areas where managers address the employees. 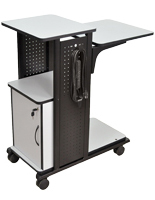 The convenient design of the workstation offers numerous access points for users to load and unload integrated technology. Power strips are available with certain styles to charge the electronic devices before, after and during the speech. This versatile style of office furniture is an economical and sylish choice for any business to protect and store valuable equipment as well as to offer versatile, productive space for everyday work.